In a face-off between two sequels starring blue things, Captain America: The Winter Soldier narrowly edged out Rio 2 to remain at the top of the box office. 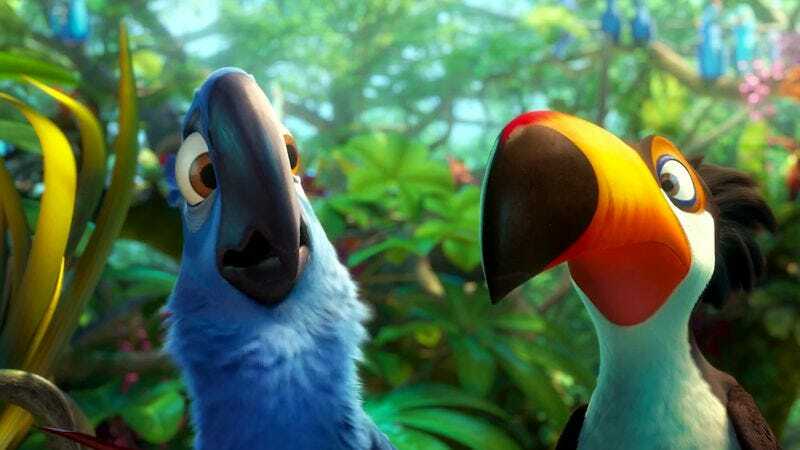 The sequel to Fox’s computer-animated hit about the environmentally conscious adventures of tropical birds took in $39 million to land at second place—possibly reflecting the current family movie craze for ice, rather than the balmy climes of the rainforest, or that adding the voice talents of Andy Garcia is not the catnip to kids one might assume. Still, with little other family movie competition in the immediate future, the Rio franchise should flourish long enough to justify a Rio 3 where Fox can adjust, maybe having its talking birds reverse-migrate to the Arctic and bringing in, say, Chazz Palminteri as a snow goose. The rest of the top five was further dominated by slight variations on things you’ve seen before, with third-place finisher Oculus—about a mirror that reflects every haunted house movie made within the last decade—besting fourth place’s Draft Day, in which the shadows of Kevin Costner’s sports-movie heyday and Ivan Reitman’s once-impeccable comedic voice flicker on the wall while a fake NFL manager talks on the phone. While Oculus’ $12 million take put it on the same level as Insidious (potentially setting up a sequel, Oculus: You Can Also Kind Of See Your Reflection In The Toaster), Draft Day’s $9.75 million is down even from Costner’s recent 3 Days To Kill, which was itself a disappointment from the equally tepid Jack Ryan: Shadow Recruit—all of which were stacked right on top of each other for some reason. In retrospect, Costner might have been wise to remember that my dad only goes to the movies like twice a year. In limited release, Nicolas Cage returned to serious acting with David Gordon Green’s Joe and was, naturally, rewarded with modest returns, taking in $106,000 in 48 theaters. Still, Nicolas Cage doesn’t do it for the money, at least once every five years or so. Similarly, Jim Jarmusch’s Only Lovers Left Alive offered an unusual, intelligent spin on vampire mythology and was relegated to just four theaters—where it nevertheless made an impressive $97,000. Meawhile, The Railway Man—seemingly a plum piece of Oscar bait, what with its stories of WWII and POW torture, its cast of Colin Firth and Nicole Kidman, and its Weinstein pomp—was similarly disappeared into just a handful of theaters to earn $64,500. Though, it still beat out Cuban Fury, another movie with elements people typically like—a comedy with Nick Frost, Chris O’Dowd, Rashida Jones (and briefly, Simon Pegg)—but which didn’t add up to more than $55,500 across nearly 80 theaters.